Lost minutes could be costing you thousands of dollars per year! Control your labor costs while you save time and money by reducing payroll errors. This versatile time and attendance software will accommodate your holiday, overtime, shift and pay period policies and offers a wide range of reports. In addition to accurate time records, the wide range of management reports included in the Attendance Rx software gives you the power to analyze that data as part of your personnel management program. You don't have to change your compensation policies to work with Attendance Rx. This powerful software is flexible enough to accommodate your existing holiday, overtime, shift and pay-period policies. This versatile time and attendance software eliminates the need for paper time cards and handwritten records — your employees can clock in and out from a PC. The affordably priced ATRx ProxTime™ is a complete time and attendance system featuring a sleek proximity badge terminal that will look good in any office environment. Simple — Employees can clock in and out simply by passing their badge near the front of the terminal. Eliminates the need to constantly reorder paper time cards. The proximity badges are more durable than magnetic stripe or bar code badges. Adaptable — Handles two classes of overtime and 7th day overtime for weekly, bi-weekly, semi-monthly and monthly pay periods. No need to change the way you handle payroll! Versatile — Records exempt employees' sick time, vacation and holidays. No more separate paperwork for exempt and non-exempt — all of your employees can use Attendance Rx! Useful — Real time In/Out Board. It's easy to see who's in or out of the office — no polling required! Economical — Saves time preparing payroll. Supervisor can edit and approve the electronic time cards at the PC. The software automatically calculates hours worked and reports are all run at the PC. Reduces paperwork and speeds up the payroll process. Smart — Save time by importing employee information from Acroprint's HRx Human Resource software . Convenient — Allows for employee data exchange between Attendance Rx and QuickBooks Pro®. Enter the data in either system and it will seamlessly be entered into both. Attendance Rx does not require terminals, badges or time cards — up to 50 employees can punch in and out at a designated PC. No more paper time cards or handwritten records! If you need additional capacity or want employees to be able to clock in and out from multiple networked PCs, check out Attendance RX Network, with support for up to 100 employees. 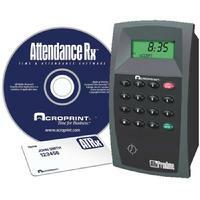 Attendance Rx software installs easily. A helpful User Manual and built-in software "Wizards" will guide you through setting up the software. If you need further assistance, visit the FAQ Center for answers to common questions and additional information. Acroprint also offers 30 days of free email or telephone support (with proof of purchase) to insure you get up and running smoothly! Attendance Rx is an accurate and simple record keeping solution ideal for office or light industrial environments of up to 50 employees. Featuring data exchange with Quickbooks Pro and the ability to export hours to many popular payroll programs, Attendance Rx will increase accuracy and speed of payroll preparation. System Requirements - "Caution Geek Stuff"
ProxTime terminals require 120VAC, 60Hz. ATRx10 primary terminal must be installed within 50 feet of the PC.